All trees can vary slightly in size slightly and we would not recommend putting up the wire supports until the trees arrive. 1 Shorten main leader to third wire – if not reached do not prune. 2 Cut side branch leaders back by one third. 3 Shorten any side shoots (laterals) on side branches to 3-4 inches if not already done. 4 Spur back any shoots arising from central stem if not already done. a) Shorten laterals on side branches to 4 inches. b) Shorten any laterals (shoots growing from laterals) to 2-3 inches. Do not prune any shoots which are shorter than 8 inches. d) Tie in the main leader also the selected shoots for the third tier. Remove unwanted shoots from central stem, also tie in side branch leaders. a) Shorten main leader to appropriate wire. b) Shorten side branch leaders by one third. c) When main leader or branch leaders have extended as far as required cut back each year to point of origin. d) If new growth has occurred after summer pruning cut back to a new bud. Note – Apples and pears can be grown as ‘fans, in this case prune as described for espaliers but there will not be a main central leader. The ideal tree shape for planting against a fence or a wall. Step overs are can be used to edge borders. Due to the size and shape of the Espaliers and Fan trained fruit there is a £40.00 maximum delivery charge that applies to any orders including these trees. Plants have to be despatched with a pallet courier and are only available for a UK mainland delivery. The Espaliers and Fans are approximately 1.5 metres wide and 1.65 metres in height. 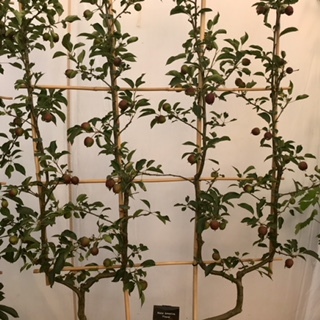 These fruit tree's has been grown specifically in a Double U shape, which makes it easier to pick and is great for growing against walls, fences or as a garden divider. These trees have been grown for a substantial number of years to form this lovely shape that will look great in any garden. If you are limited on space these would be a perfect addition to the garden. Double U Cordons - Plant at 1.2 Metres apart.